Our Sri Lanka team are proud to announce the opening of Modaravila Community Center located in Panadura. The center was funded by two previous Projects Abroad volunteers, Rosanne van Herksen and Susanne Jongerious, and many of the volunteers in Sri Lanka have helped to paint and decorate the finished building. Staff and volunteers were invited to the opening ceremony last week. 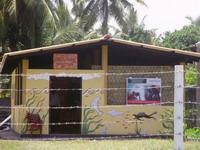 The center is located in a tsunami resettlement area, and it is the first facility for young children in the area. Volunteers have worked on care projects in the area for several years, and volunteers will now also be able to help out at the center.